Widely known as India’s no. 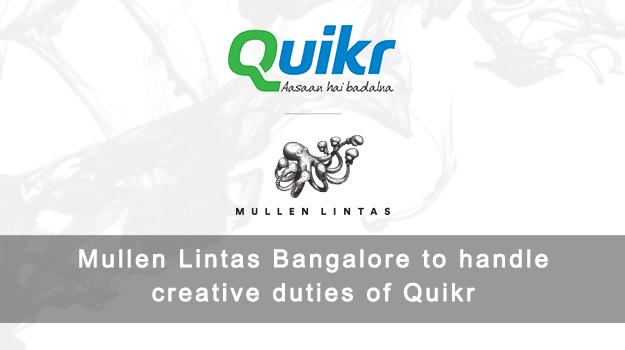 1 online classifieds platform, Quikr has appointed Mullen Lintas Bangalore as its creative agency. Mullen Lintas was selected after a competitive multi-agency pitch that saw the participation of some leading advertising agencies in India. What began as a pitch process for two verticals quickly went on to the entire Quikr group portfolio and Mullen Lintas has now been mandated to handle all the verticals. This win marks another major triumph for Mullen Lintas that has been on an upward growth swing over the past few months. Only recently, the agency had won the creative mandate for Too Yumm!, the new food brand from RP-SG group company Guiltfree Industries; plus the creative mandates for Motilal Oswal, a leading equity funds player in India and Tata Cliq, the e-commerce retail store from the Tata Group.